Indulge all you like! 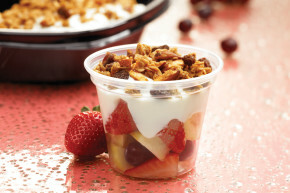 Fresh organics, dozens of toppings, real cheeses, fresh-made sides and famous mini-muffins. 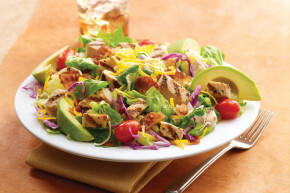 add a side of: chicken salad with almonds and pineapple, tuna salad with eggs, ham, turkey, smoked turkey or natural, grilled chicken breast - $1.79. Organic wheat wrap with mushrooms, organic spinach, asiago, guacamole, pico de gallo and salsa on the side. Served with fresh fruit, steamed veggies or baked chips. Grilled zucchini, muenster, organic spinach, red onions, roma tomatoes, kalamata olives, roasted red pepper hummus, toasted on 9-grain artisan bread. 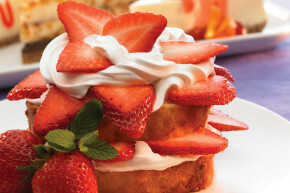 Served with fresh fruit, steamed veggies or baked chips. Your choice of bread, cheese, spreads and toppings! Served with chips or baked chips. 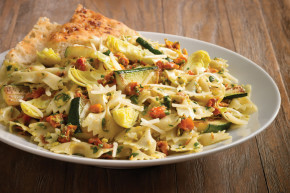 Bowtie pasta topped with grilled zucchini, roasted tomatoes, organic spinach, artichokes, asiago. Served with warm, herb focaccia bread. with chips and your choice: cup of Soup OR Fruit. Toasted onion bun with turkey breast, sliced avocado, jalapeño pepper jack, red onions, roma tomatoes, lettuce, stone ground mustard. Natural, grilled chicken breast, bacon, Swiss, guacamole, tomato, Russian dressing, grilled on whole grain wheat. Named for our Founder’s Dad. 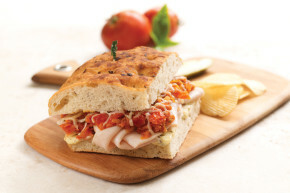 Toasted herb focaccia with turkey breast, asiago, roasted tomatoes, walnut pesto, mayo. Meatballs, Italian red sauce, provolone on New Orleans French bread. Toasted croissant with turkey breast, bacon, Swiss, guacamole, tomato, organic field greens, mayo. 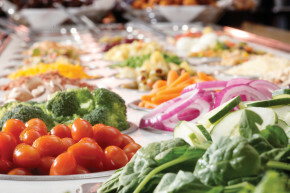 Served with fresh fruit, steamed veggies or baked chips. Toasted croissant with smoked turkey breast, ham, bacon, Swiss, cheddar, leafy lettuce, tomato, honey mustard. Herb focaccia with smoked turkey breast, bacon, provolone, chipotle aioli, organic spinach, roma tomatoes. Toasted whole grain wheat with ham, turkey breast, bacon, cheddar, Swiss, leafy lettuce, tomato, mayo. Smoked turkey breast, bacon, jalapeño pepper jack, guacamole, roma tomatoes, Russian dressing. Pressed within olive oil-basted French bread. Natural, grilled chicken breast, provolone, walnut pesto, roma tomatoes, organic spinach. Pressed within olive oil-basted French bread. Organic wheat wrap with natural, grilled chicken breast, cheddar, jalapeños, pico de gallo, Southwest spices, ranch dressing. Served with organic blue corn tortilla chips and salsa. Organic wheat wrap with turkey breast, roma tomatoes, organic field greens, guacamole, ranch dressing. 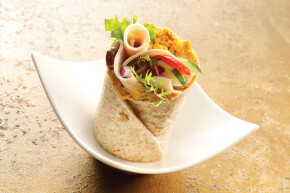 Organic wheat wrap with chicken salad made with almonds and pineapple, roma tomatoes, red onions, leafy lettuce. 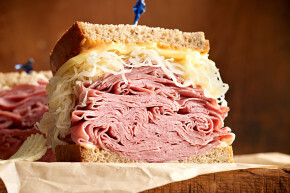 1/2 pound of hot corned beef or pastrami, Swiss, sauerkraut, Russian dressing, grilled on rye. 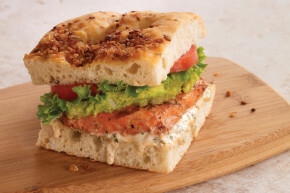 Marinated, grilled wild Alaskan Sockeye salmon, guacamole, roma tomatoes, leafy lettuce, chipotle aioli on toasted herb focaccia. 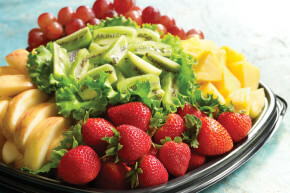 Served with fresh fruit, steamed veggies or baked chips. Tuna salad with eggs, Swiss, mayo, tomato, grilled on whole grain wheat. 3/4 pound combo of hot corned beef and pastrami, Swiss and your choice of mustard or mayo, on rye. 1/2 pound of hot corned beef or pastrami. Your choice of bread, topped the way you like it. 1/2 pound of hot roast beef, provolone, mayo on New Orleans French bread with a cup of au jus. Bread choice: wheat or white. 440 calories on wheat, 460 calories on white. Bread choice: wheat or white. Bread choice: wheat, white or organic wheat wrap. With natural, grilled chicken breast. Natural buttery blend, bacon, cheddar, sour cream. cranberry walnut oatmeal, chocolate chip, white chocolate macadamia, peanut butter.